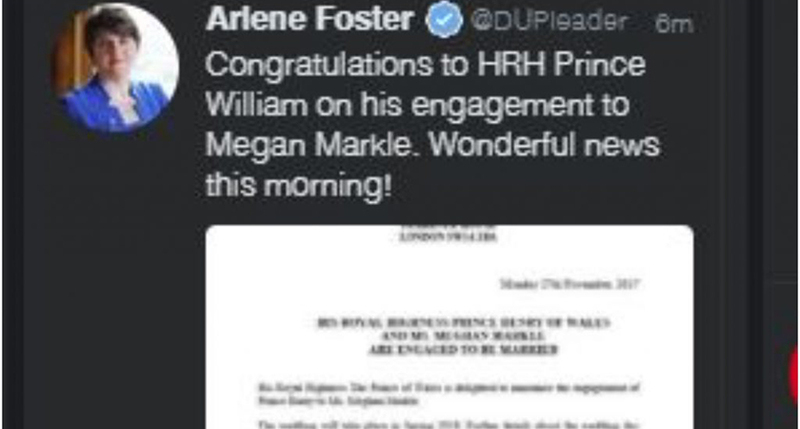 THE leader of the DUPs Arlene Foster has blamed a staff member for mixing up Prince Harry and Prince William in a tweet. The party leader tweeted her congratulations yesterday to Prince William on his engagement to Hollywood actress Meghan Markle. However, the tweet was deleted shortly after it was posted as it was pointed out that the wrong prince had been congratulated. The tweet was deleted soon after it was posted on Arlene Foster's account yesterday. In a tweet apologising for the mix up, the Northern Ireland First Minister said: "Apologies to TRHs Princes William & Harry for tweet error on my account earlier. "I stopped tweeting personally a long time ago. Genuine typo by a member of staff. "Guilty of tweeting too fast. There goes any chance of an invite!! :-) AF"